Shelagh’s an iconic broadcaster, a lover of Canada’s North and music, a voice for mental health issues and someone we admire. It was a thrill to talk to her about cooking and cleaning far South on The Next Chapter, April 11, 2016. Includes an interview excerpt and recipe for Roasted Beet Salad. The Antarctic Book of Cooking and Cleaning is somewhat reminiscent of Susanna Moodie’s Roughing It in the Bush — both are memoirs of women managing life on a frontier. The seeds of the book were planted about 20 years ago, when Carol Devine led an ecological cleanup expedition to a Russian research station in Antarctica. 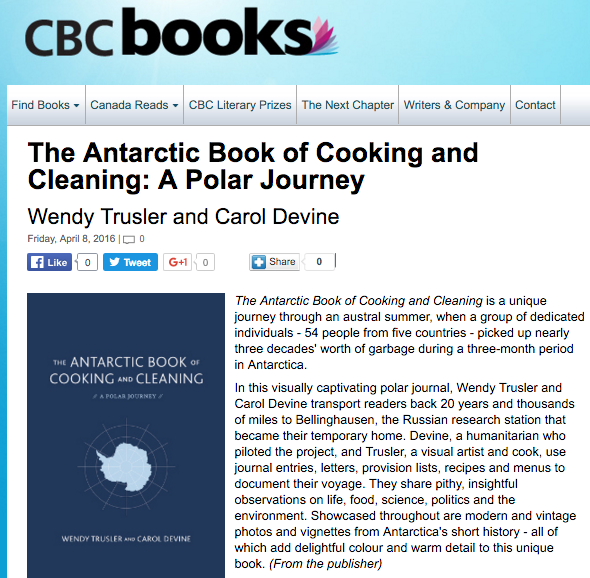 Her one condition was that she could hire a cook, and ended up bringing along Wendy Trusler, an artist who had cooked for tree-planting camps across Canada for about nine seasons and was feeling “ready for an adventure.” Together they’ve created The Antarctic Book of Cooking and Cleaning. It uses journal entries, maps, meal lists and recipes to tell the story of their time in one of the most remote corners of the world.